Enjoy the pampering of the World's Best Cabin Staff on the most spacious plane in the skies. 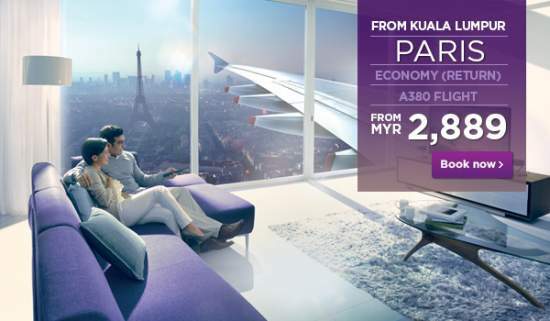 Stand to win an upgrade to Business Class (return) when you fly Economy Class from Kuala Lumpur to Paris between 1 March and 30September 2013. Malaysia Airlines has 20 seats to give away! Book now and let the comfort of Malaysia Airlines' A380 bring that cherished joie de vivre and added romance to your dream trip!